A 56-year-old female patient with a past medical history of hypertension and type II diabetes mellitus undergoes a diagnostic aneurysm at 1 year after coil embolization of an anterior communicating artery aneurysm. Fortunately, the aneurysm had been coiled prior to rupture, and the patient had not suffered any neurological deficits. 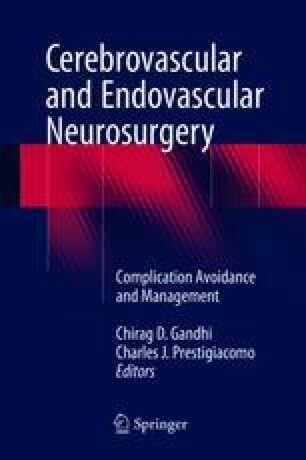 Other than some difficulty in gaining access to the right common carotid artery, the angiogram went without any particular setback. In the post-procedure recovery unit, the patient complained of left arm weakness. Upon examination, the patient was unable to move her left arm, and it had no tone. She was rushed back to the angiography suite, where she was discovered to have a thrombus in a distal MCA branch, unable to be treated. MRI showed an MCA territory infarction. She was sent back to the recovery unit, where the attending physician explained the undesired outcome and the steps which would be taken to optimize her long-term outcome with hope of regaining some function in the left arm. Was this a medical error resulting in neurological deficit, or was this a complication of the procedure? Sokol DK, Wilson J. What is a surgical complication? World J Surg. 2008. https://doi.org/10.1007/s00268-008-9471-6.